Author Peter Mayle returns to his beloved Provence for another stunning insight into life in the French countryside. Whether you have never been to Provence or know the region well, Encore Provence will captivate you with its remarkably engaging tales of Provençal life. The book takes you through delightful country dinners, bustling markets, and engagements with delightfully pleasant locals. 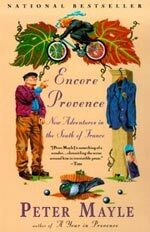 With Encore Provence, Mayle immerses readers so completely, that they will truly feel at home in Provence. "He is something of a wonder...chronicling the scene around him in irresistible prose, the joys of a bountiful climate, brilliant sun, and a splendid cuisine." "He virtually establishes a lip-licking new literary genre-- call it dinnerotica...He is becoming an American Evelyn Waugh."